Join Olmsted Parks Conservancy and Louisville Parks and Recreation for cider and donuts to celebrate the completion of the Bonnycastle Hill restoration project in our beloved Cherokee Park! No need to RSVP—simply attend if your schedule allows. Contact Meghan Robinson with questions. We are thrilled to share the new Stegner Pavilion, relocated basketball court, lit walking paths and reconfigured parking area with our vibrant community of park users. Olmsted Parks Conservancy proudly thanks Louisville Parks and Recreation, the City of Louisville, Mayor Greg Fischer, Councilman Brandon Coan, the Stegner Family and other generous donors to our Campaign for Extraordinary Parks for their partnership and support of this successful restoration project. 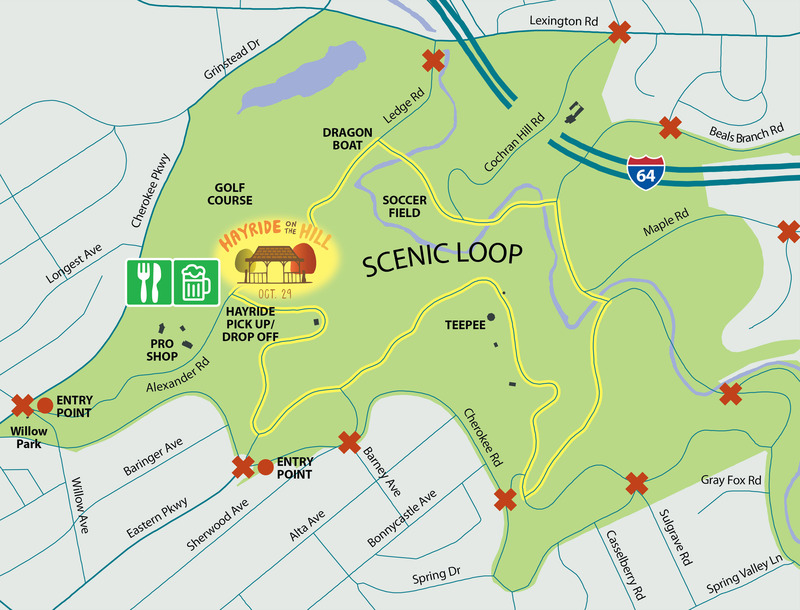 The Scenic Loop and various access points to it will be closed to vehicle traffic beginning at 9 a.m. on Monday, October 29, and will reopen at 9 p.m. that same day. Access to Cherokee Golf Course will still be available via Alexander Road. Meanwhile, at Baringer Hill, the Hayride on the Hill event will include food, beverage and beer vending; free hayrides around the Scenic Loop; live music, face painting and member treat bags provided by Olmsted Parks Conservancy. Rainbow Blossom is sponsoring this free family event, and The Comfy Cow and ValuMarket are the food and beverage vendors. “We appreciate Rainbow Blossom’s generous event sponsorship and continued support of Olmsted Parks Conservancy,” George said. 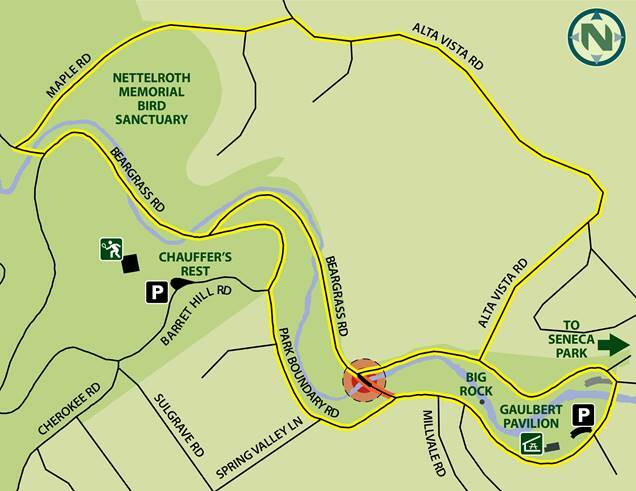 See the attached map for the event layout and to locate which entrances to the Scenic Loop will be closed to vehicle access on Monday, October 29. Olmsted Parks Conservancy and Louisville Parks & Recreation have begun a $1,100,000 restoration project in the Bonnycastle Hill/Hogan Fountain area, one of the most active areas in Cherokee Park. To improve the area and provide a better park user experience, a picnic pavilion will be added in the southern area, the basketball court will be relocated, and other improvements include walking paths, and an upgraded parking area. The McCall shelter will remain in the area. This popular area of Cherokee Park is named in honor of Mrs. Hattie Bonnycastle who donated the land to the city in the late 1800s. The Bonnycastle Hill area was included in the original plan for Cherokee Park by Frederick Law Olmsted. Sharing this area is the popular Hogan Fountain landmark, designed by Enid Yandell. The Project is made possible by financial support from donors of Olmsted Parks Conservancy’s Campaign for Extraordinary Parks including the Stegner Family, along with support from the City of Louisville, Mayor Greg Fischer, Councilman Brandon Coan and Louisville Parks and Recreation. Estimated completion will be Fall 2018.